The woman looks like the heroine of Phantasy Star. 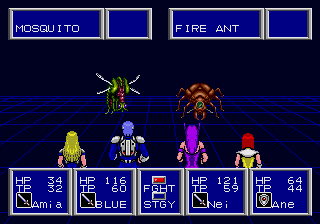 Phantasy Star II is a game that starts with a nightmare of a woman struggling in a fight. Your hero is in a lazy utopia that nearly killed the young lady he adopted. To the north of town is an armed mugger in the tunnel to the towns to the west. Your hero doesn’t talk to him because he’s one of the guys that wanted to kill that adopted young lady. Each shop has a different shopkeeper to greet you, and the farewell changes if you don't buy anything. 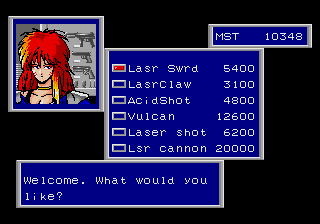 Much like the first game, Phantasy Star II is a science fiction themed game. You’re not raised in a church or warped by magic. Instead, there’s teleporters and cloning stations. Your team is a crew of outcasts and dissidents who slowly get frustrated with the utopia and wander to join you. This shows all potential characters in the game. "See Strength" gives their backstories. On the other hand, the game is hard and slow to play. The dungeons are mazes (mapped in the manual, yes,) covered with this screen of pipes or the like. The screen that blocks your view as you walk around was a technical masterpiece at the time – and incredibly annoying. Many of your companions come with little more than the clothes on their back and low levels. Dungeons are long, and confusing. You can spend an area of the game basically fleeing in terror. You do not win the game. The brownish pipes do not scroll, while the walls and floor do. Technically amazing, but irritating. In fact, that’s one of the most remembered thing about this game. The ending of the game is an ambigious one, but it’s pretty clear your heroes more than likely do not survive it. In fact, most people think Final Fantasy IV is the first good example of a game showing characters that die. 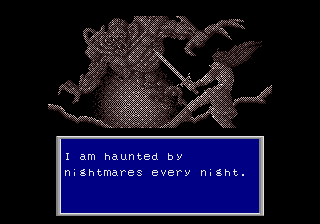 Back in 1989, a character dies in Phantasy Star II. To keep spoilers to a minimum, the plot is basically that the world is being slowly corrupted, and your heroes discover the conspiracy. Despite impossible odds, they uncover the truth. Note the "cyberpunk" esque flavor of the battle screen. The battle system is automated – you pick strategies and then let the battle run out. 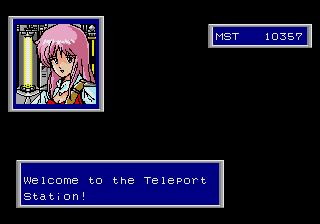 There’s a Dragon Quest II style “Teleport to where you last saved” spell, and a “escape from dungeon” spell. 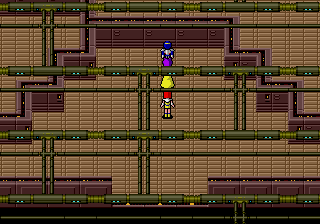 However, the teleporters allow you to travel from town to town more easily unlike Dragon Quest II. Enemy attacks are animated, as is your hero’s attacks. If the game wasn’t so grindy, then I think more people would finish it. As it is, most people would give up at the mazey dungeons. They’d give up as the enemies get stronger with every town and the weapon prices skyrocket. They’d give up at some of the nasty tricks (walking through ‘black’ space to access another part of a dungeon, or say, paying an out of the way musician for lessons?) Still, I think the game is worth seeing, even if most people won’t like it. There are actually some really nice LPs of Phantasy Star I, II, and III by someone called Thuryl hosted on the LP Archive. I’d say they’re worth a look even if you have played the games before, because the first two expand on the story in well written and interesting ways, and the third is delightfully irreverent towards the black sheep of the Phantasy Star series. I’ve actually seen some of Thuryl’s work. He does a very nice job. 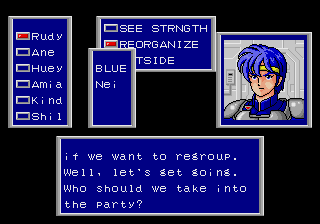 Phantasy Star III apparently had some elaborate family name stuff that was lost in translation, and some political stuff that was replaced by generic lines. It’s still such a flawed game, unfortunately. I played it back in the day, and remember thinking that Phantasy Star II was a heck of a lot more fun to play, even with all the grinding.